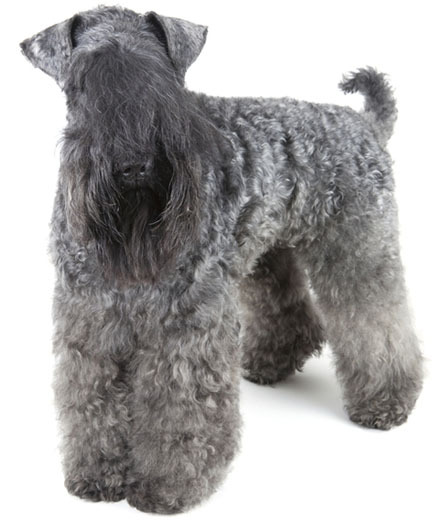 Learn about the temperament and personality of the Kerry Blue Terrier. Discover what he's like to live with, his traits and characteristics and how he generally behaves. And look at lots of Kerry Blue Terrier photos. Kerry Blue Terriers are lively and entertaining dogs, energetic and fun loving, boisterous and playful. They have a unique sense of humor and will consciously try to make you laugh when you are sad. They have the typical terrier personality: inquisitive, bossy, proud, tenacious, feisty, brave, and stubborn. They require daily exercise and enjoy jogging. They also require consistent and patient training. With this breed, obedience training is for life. It is not something that you do as puppies and then call it a day, but a long term commitment. A Kerry who knows consistency and affection will be trainable and eager to please his owner. A Kerry with an inattentive or submissive owner will run the entire house. He truly needs an owner more stubborn than he is. He will quickly learn exactly what he can get away with. He is a family dog, not a one-person dog, and does well with children. He enjoys rough and tumble play and he is tolerant and understanding of children's behavior. He is protective of his people and is a good watchdog. Some people find his love of barking to be a bit much. These are people-oriented dogs who thrive on love and attention. They do not do well if left alone for long periods of time. They need constant human interaction and will follow you everywhere. They are often dog aggressive and unaltered males in the same household will almost certainly fight. A Kerry Blue Terrier will not back down when challenged by another dog. He will also chase your neighbor's cat and you will soon become convinced that he is absolutely obsessed with squirrels. You might not want to bring a Kerry into a home with small pets. The Kerry Blue Terrier is an intelligent, all-purpose dog. But you will also be getting an often pugnacious, always high-energy, frequently dominant dog who sometimes has a temper. But Kerrys are also sweet, sensitive, loyal, and full of love and life. The Kerry Blue Terrier is intelligent and quite easy to train. He learns new commands quickly at an above average rate. The Kerry Blue Terrier sheds practically no hair at all. You'll virtually never find a hair in your home!